The World Meteorological Organisation’s annual “State of the global climate” is no longer just about signs of what is to come. Its 2018 report, released last week, describes climate change as it is now unfolding. It is not a pretty sight; if you’re after an easy read you’d better stop here. Climate change is starting to bite among communities around the world, and in these early stages, as has long been anticipated, it is the poorest and most marginalised which are most affected. Many people living in tropical and other hot regions are discovering that heat alone can be deadly. Last December experts from six continents reported strong trends toward greater frequency, intensity and duration of heat events, with wide-ranging health impacts. This is not trivial. Being warm-blooded mammals, humans need to be able to throw off heat. Very hot days and high night-time temperatures make that difficult or impossible without air conditioning. In those conditions people become heat-stressed and die in large numbers. Exposure to heat, said the WMO report, is potentially a huge health impact of climate change, with extreme exposures leading to “a cascade of illnesses including heat cramps, heat exhaustion, heatstroke and hyperthermia”. People most at risk are those undertaking physical activity outside and those with existing health issues. Multiple heatwaves create cumulative stress on the human body that exacerbate major causes of death, including respiratory, cardiovascular and kidney diseases and diabetes. The WMO cited figures showing longer heatwaves this century afflicting about 125 million more people compared to a similar period from 1986. In 2015 alone, 175 million people were exposed to 627 heatwaves, including 65,000 residents of Karachi hospitalised with heat stress. A bad situation is made worse when electricity supply is disrupted due to system overload, a situation familiar to tens of thousands of Australians last summer. Food security is another major concern of the WMO report, which identified hunger resulting from wet-dry extremes as a rising global threat to human health, economic well-being and political stability. Climate change threatened to reverse gains made during decades of steady progress in alleviating hunger, the report said. It cited new evidence that world hunger was now rising, with undernourished people now numbering over 820 million. The biggest impact of climate change is being felt in Africa, where food insecurity and malnutrition is afflicting 59 million people in 24 countries. Most vulnerable are dryland farming and pastoral communities comprising 80 per cent of the continent’s rural population. The report said that 40 countries globally, 31 of them in Africa, continue to need external food aid, a result of climate-induced production declines as well as persistent conflict. Cereal harvests declined in 2018 in western and northern Asia, South America and the Caribbean in 2018. The number of people affected by food insecurity increased to 1.3 million in southern Africa and Madagascar in 2018, associated with dry spells and tropical cyclones that cut cereal production. 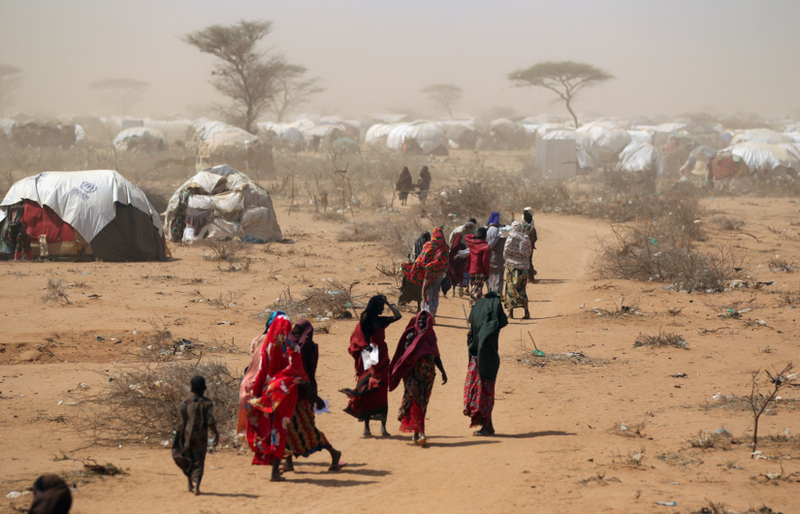 In Somalia, about 2.7 million people needed emergency food aid. In our own region, Typhoon Manghkut in mid-September resulted in crop and fishery losses that worsened food insecurity and malnutrition across the Philippines. People on the move create an additional burden on food resources. In just the first eight months of 2018, the report said, over two million people globally were displaced by weather and climate disasters, notably drought, floods and storms. Displacement resulting from conflict in Somalia and Myanmar was exacerbated in both cases by climate-related events, notably flooding and drought. Myanmar refugees were afflicted by extreme flooding in Bangladesh, forcing 200,000 to flee the camps supposed to give them sanctuary. In Somalia, both sudden and slow-onset weather events during the year combined with conflict to displace 883,000 people, leaving at the year’s end a total of over a million displaced citizens. The WMO report highlights how climate events and conflict feed off each other, making a bad situation much worse. The miserable experience of these countries today is a guide to what unmitigated climate change can do, and Australia should take note. Our government claims success against emissions targets using Kyoto land-carbon credits, long abandoned by almost every other country, to disguise steadily rising industry and transport emissions and to lull Australians into a false sense of security. Our country’s wealth shields us from the climate impacts being felt in poorer places, but that too is false security. We should not forget that we are the driest of inhabited continents and one of the countries identified as being most at risk from climate change. Global warming means what it says. Australia is not a world on its own. People’s experiences today in Africa and Asia could one day be ours too. We need to start pulling our weight as global citizens.